Growing up in Europe, the Cook Sisters have childhood memories of Christmas dinner ending with a fiery plum pudding. It was made a year ahead of time, then steamed for a couple of hours before arriving at the table doused with flaming rum and served up warm with rum butter and Christmas crackers. The fact that we never actually liked the pudding itself never stopped this Old World tradition from being our favorite part of the meal. Scroll forward a few decades, and today we have our own traditions. We offer up this dessert for consideration. It makes a great dinner-party dessert because it’s not heavy, and it’s healthy, which leaves diners feeling virtuous. What could be better to end a Christmas dinner? Don’t answer that. Just enjoy this. We demoed this for Brookside back in 2011. Zest one orange and reserve. Trim oranges of their skin and white pith; reserve top and bottom for juice. Cut trimmed orange in half lengthwise and remove core. Lay the halves flat and cut into half-moons. Arrange orange slices on a platter. Using a small paring knife, dice crystalized ginger; mix with orange zest and scatter over orange slices. In a small, heavy saucepan, heat 2 T water and the sugar until they begin to boil. Turn the heat to medium and simmer 5 minutes until sugar turns to medium brown; remove from heat. Carefully drizzle caramelized sugar over prepared orange slices; the sugar will bubble and sizzle and harden in place. Squeeze juice from reserved orange ends over the caramel. Scatter mint over all and serve within an hour for maximum crunchiness. This combination has it all – tart lemon, crunchy nuts, sweet pomegranate seeds. It’s also chock full of nutrition and it’s versatile. Great over grilled or sauteed fish, grilled chicken or roasted or grilled lamb and even vegetables. You could serve it as a dip or toss a salad with it. Pomegranate molasses is a staple of Middle Eastern cuisine and can be found in specialty food stores or on line. There’s nothing quite like it, but you can substitute balsamic syrup, made by boiling down balsamic vinegar until it becomes slightly syrupy. We adapted this from Fine Cooking and demoed it last January. We’re rolling it out again for our September 2015 Mediterranean demos at the US Botanic Garden in honor of its new exhibit from the region. This time, Danielle had the pleasure of making this dish, served on pita bread. Process the tahini, lemon juice, garlic, cumin, ¼ t salt, and 5 T water in a food processor until smooth, about 1 minute. In a medium bowl, gently toss the almonds, walnuts, cilantro, onion, olive oil, parsley, mint, and pepper flakes with ¼t salt and 1/8 t pepper until well combined. Season to taste with additional salt and pepper, if necessary. 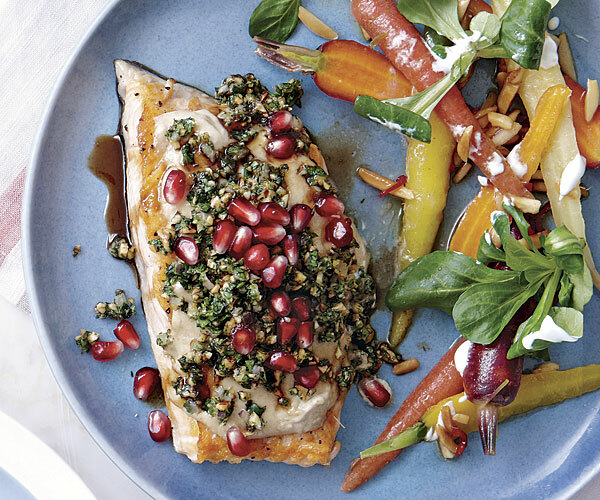 Serve the tahini sauce sprinkled with the nut-herb mixture and topped with pomegranate seeds. Drizzle pomegranate molasses. 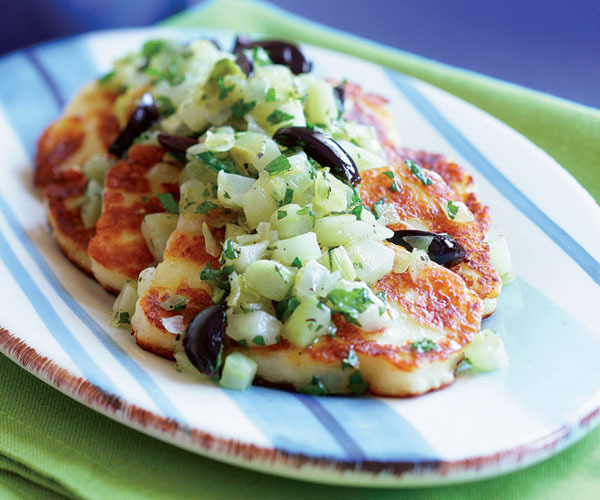 Halloumi is the cheese you can cook. 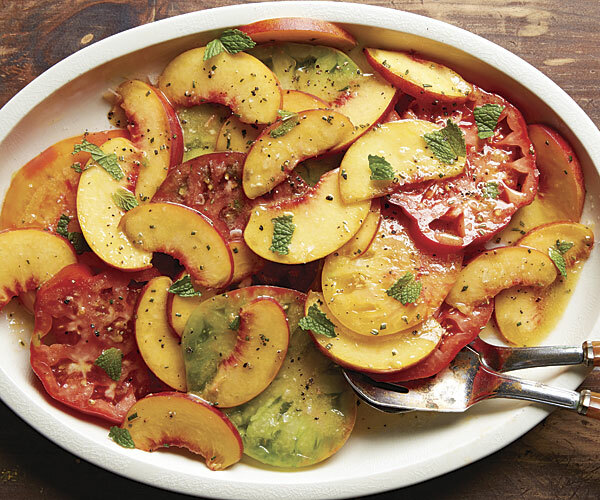 It doesn’t melt, it just gets a nice crust on the outside when you pan-fry or grill it. Salty, chewy and intense, the cheese is a favorite in Cyprus, its country of origin, where in the summer it is commonly served grilled with tomatoes or watermelon. Halloumi is becoming increasingly popular around the globe and when you try this recipe you’ll understand its following. High in protein — the cheese is typically made from goat or sheep’s milk — it’s a great substitute for meat in vegetarian diets. This treatment makes it a good choice as a first course. Served as a side with a rice pilaf or lentil stew, you have a lovely filling meal you won’t soon forget. The remaining half of the fennel bulb can be added to a roast vegetable to accompany this or your next meal. This recipe was adapted by Adrienne, who demoed it at USBG September 16 2015. Heat 2 T olive oil in a heavy skillet over medium heat until hot. Add the fennel and onions, cover and cook gently, stirring occasionally, until the vegetables begin to soften (but don’t let them brown), 2-3 min. Reduce the heat to medium low, add 1/4 t salt and 1/4 t pepper and continue to cook until the vegetables soften completely, another 2-3 min. Turn the heat to low and stir in the olives, lemon zest, mint. Transfer to a bowl and reserve. Wipe out skillet and add remaining olive oil; heat on medium high until hot, about 1 minute. Working in batches if necessary to avoid crowding the pan, cook the halloumi until golden in spots, about 2 min. Flip and cook until the second side of each slice is golden, about 2 min. more. Reduce the heat as needed if the halloumi is browning too fast. Shingle the halloumi on a serving platter. Stir the vegetables and spoon over the halloumi, drizzle with hot olive oil from skillet. Serve immediately.